MEMP…MEMP…MEMP…BEEEPPP…The National Weather Service in Car-i-BOO Maine has issued a — I heard the mechanized voice over and over in the car on Thursday afternoon, seven times just between Yarmouth and Portland, occasionally varied with GRAYMaine. I kept listening to the warnings through the early evening, hurrying out to walk the dog before a thunderstorm hit. I’ve got a different feeling about storm warnings than I had just a few months ago. Tornadoes just won’t seem to go away. My friend, Kathrynzj, who is here today, recently spent part of an evening speeding home and hoping her mom and her little boy would get away from the place where a tornado hit near his t-ball field. They’re all fine, but that’s not true for other families in other places. On that same day, Susan Tierney, who many of you remember, asked on Facebook, “How will I know if there’s a tornado?” And the answer came, if you hear something that sounds like a freight train, get down to the basement. And I wonder if we are ready for a Holy Spirit experience that sounds like a freight train bearing down on us? Because when that train hits, it changes our lives, whether we like it or not. Once this rain ends, we will have our hands in the vegetable garden or our flower beds. We’re thinking about what we’ll do with the unbelievably beautiful strawberries that grow in Maine, picturing the peas we will eat and watching the corn grow higher with our eyes on August and the sweetness of the kernels that explode in our mouths. We prefer the peace of predictable growth and eventual harvest. And sometimes that works for God, too. Sometimes the Spirit falls on us like a late spring breeze, encouraging us gently in a new direction. But other times, the movement of the Holy Spirit looks and feels and sounds more like the tornado that pulled water right up out of the Connecticut River at the same time it spat debris into the sky like birds in frantic flight. Sometimes it ought to come with a storm warning, a notice that it may produce hail and contain powerful winds. We started worship today with people unprepared for the coming storm. We heard the story of Christ’s Ascension, as told by the author of Luke and Acts. The disciples stand, open-mouthed, staring up into the sky, and they are visited by two men in white–angels?–who ask why they are staring, a set of slack-jawed yokels overwhelmed by the supernatural departure of their already back-from-the-dead teacher, friend and Lord, and I want to know, why wouldn’t they be? I can’t imagine any of us doing differently than standing awed and terrified and perplexed, rubbing our eyes against the sun, shielding them for another look to try and find the Son of God, taken away into the clouds. What next? What was next was a retreat, both literally and spiritually. The disciples and the rest of the close followers of Jesus — including his mother and the women who supported his ministry — withdrew to the upper room, the place where they ate their last meal with him, and they prayed. I imagine they mourned, too. There had been one short outburst of grief, terrible and fierce. Then the amazing, really almost impossible to believe return of their Lord, delivered a second shock. Different gospels tell different stories of his appearances to them. Acts gives us a timeline, describing the appearance of the Holy Spirit in Jerusalem at the time of Shavuot, a Jewish festival that brought the faithful to the Temple to celebrate God’s giving of the Torah to the people of Israel in the time of Moses. 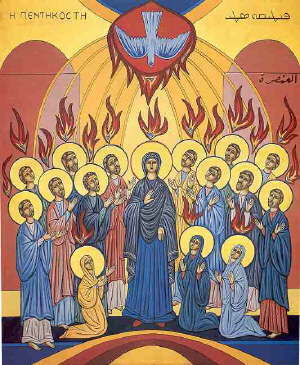 It falls fifty days after Passover, and in Greek, it was called Pentecost, which means the fiftieth day. Seven weeks have since the Resurrection, and the men and women who loved Jesus and tried their best to understand what he wanted for them huddle in a rented room, pondering and puzzling and praying. When the disciples were gathered together, praying and pondering and puzzling about what had befallen them and what might come next, the conditions were right, and suddenly a severe spiritual event occurred, moving beyond the “watch” phase and into a “warning.” The wind blew and tongues of fire appeared, and suddenly people who did not know each others’ languages understood what was being said. We call it the Birthday of the Church, as if the tongues of flame were benign as little birthday candles. But I can imagine people shocked, terrified, transfixed and amazed. And of course we know there were people who derided the disciples and decried their experience. They were drunk, right? No, no. They were not drunk. They were not crazy. They were caught up in a storm of God’s power, a manifestation of the Spirit of God promised by Jesus. We want a soft hand, a gentle breeze, a kindly prompt about our spiritual gifts and how to use them, and sometimes we get that. Sometimes we get that. But when the conditions are right, when we give ourselves over to God and pray sincerely to be guided and to be put to use, we need to watch out for the tornado that is coming, because it will change us. Believe me. The Holy Spirit will change a person. The Holy Spirit will change a church. And that can be hard. We prefer the peace of the predictable. We don’t want to lose what is accustomed. Because who hasn’t grown comfortable, even with the things that feel less than satisfactory? We love the familiar, most of us. We hold on tight to what we know. Even as the wind swirls around us, the sound like a freight train, the vibrations shaking the building, we hang on to what we know. We hope the storm will go by and leave us huddled safely in the basement. But it’s not like that with the Spirit of God. When the Spirit comes to us with such power, she will change us. And wind-whipped, we cannot go back to our lives the next day as if nothing has happened. We must–we cannot help it–we *must* change our outward lives when our inward lives have been licked by God’s flame. We must–we cannot help it–we *must* change our outward lives when our inward lives have been blown open by God’s wind. Is there a significant risk that the Holy Spirit will blow into our church like the rush of a violent wind? Are the conditions right? Oooh, really, really nice Songbird.I think a lot of us made reference to the power of wind to knock us around– I kept mentioning downed tree limbs and power lines.